Steel is an alloy of iron and a small percentage of carbon. Not only does the carbon considerably strengthen the steel, it will also start to burn at a temperature just below the melting point of steel. 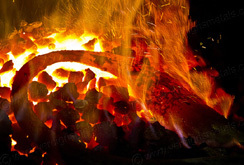 When steel is heated in a blacksmith's forge, and nears its melting point (around 1500 C), the carbon burns before the steel melts. At this point the steel is almost white hot and showering sparks. The result is that the crystal structure of the steel is altered ... radically! The steel begins to crumble and appears as though it has literally been burnt . Blacksmiths are able use this to decorative effect.